An overwhelming crowd of supporters and sound-system malfunctioning forced President-elect, of Liberia, George Weah, to postpone his victory speech on Friday night. 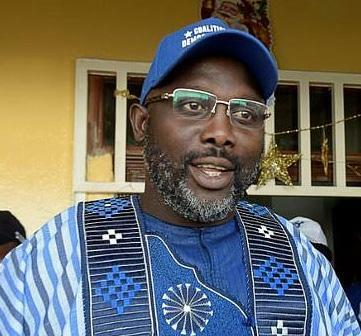 Weah was billed to formally accept his election at his Coalition for Democratic Change (CDC) headquarters in Monrovia at 6.30 p.m., an hour after his declaration as President-elect. Immediately after the National Elections Commission (NEC) announced the final results of the presidential runoff polls and pronounced him elected, the city erupted in jubilation again. Thousands of young people poured out from different parts of Monrovia and adjoining towns, and headed to the CDC headquarters located on the only road linking the capital. Soon, a mammoth crowd of ecstatic supporters filled the expansive premises where they sang and danced to music supplied by a disc jockey. It was a carnival of sort outside as an overspill of supporters sang and danced along the road, resulting in a heavy gridlock on both sides. Similar scenes played out in other parts of the city. Monrovia, was literally on standstill for Weah, a man of the people. When the president-elect finally arrived at 8.42 p.m. in company with his wife, Clar, and the Vice President-elect, Jewel Howard-Taylor, the crowd went out of control. Efforts by the CDC youth leader, Jefferson Koijee, and security men to manage the situation proved abortive as the sea of heads pressed towards the stage where the dignitaries sat. Two women fainted due to suffocation, and were lifted on to the stage where they later got revived. “We are thirsty, we want water,’’ a section of the crowd chorused, interrupting the National Chairman of CDC Campaign, Mr Toga McIntosh, who was delivering his speech. The sound system was not helping matters either, as it kept malfunctioning probably due to suffocation too. When the president-elect rose from his seat to calm the situation, the crowd went wilder in euphoria, chanting “George Weah, George Weah’’. At this stage, Weah made a hand gesture to announce the postponement of the event till Saturday. “What you are witnessing here today is a demonstration of the love and hope that the long-suffering people of Liberia have in Ambassador Weah. “We can’t help celebrating like this,’’ said Peter Konty, a supporter, who returned home on foot like this reporter following the gridlock. The post Overwhelming crowd, faulty sound-system stop Weah’s victory speech appeared first on Vanguard News.